If you’re going to pay $5 million-plus for a Super Bowl ad, you really hope that people watching the game pay attention to it, right? And it is a gamble, what with all the parties, drinking, and bathroom breaks, not to mention football that could potentially distract viewers from paying full attention to the ads. But according to TVision’s Attention Index and Media Post Communications, Bud Light’s Dilly Dilly– Bud Knight ad won the Attentiveness Bowl and was top-ranked in the attention-getting department, capturing nearly 31% more attention than the average ad in the game. Well, silly as Dilly is, it looks like A-B has successfully put another campaign smack in the middle of the cultural zeitgeist. Capitalizing on the popularity of its successful campaign, Bud Light named February 8th, 2018 as Philly Philly Day to coincide with the Philadelphia Eagles Super Bowl LII victory parade. 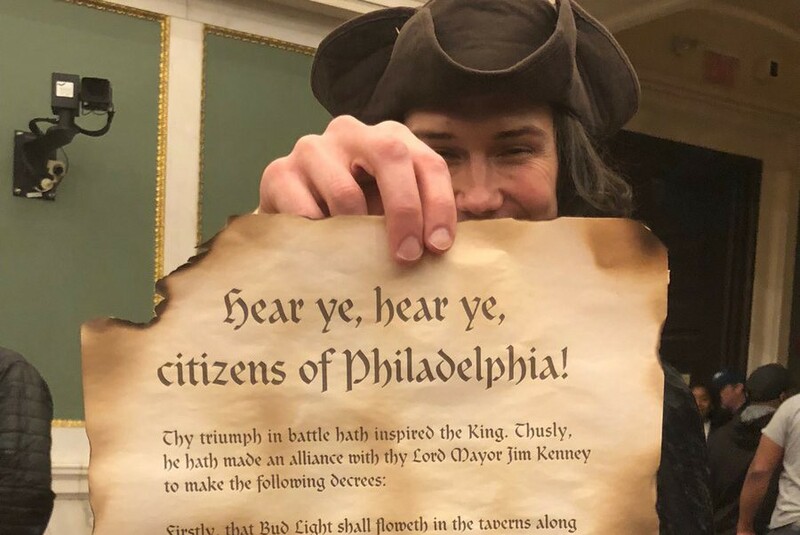 In Independence Hall style, this was announced via proclamation from a Bud Light town crier re-enactor on Feb. 7. According to Pennsylvania Food & Dining, Philly Philly has been a refrain for Eagles fans since Jan. 21, when Bud Light released a commercial featuring its king saying the phrase instead of “Dilly Dilly.” “You want Philly Philly?” . This is also what quarterback Nick Foles asked coach Doug Pederson late in the first half of the big game, before successfully executing a game changing trick play called, what else, the Philly Special.